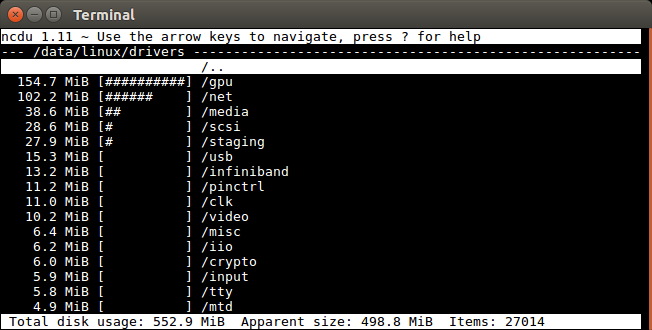 Is it possible to use ls in Unix to list the total size of a sub-directory and all its contents as opposed to the usual 4K that (I assume) is just the directory file itself? I.E. After scouring the man pages I'm coming up empty. du -sk * | sort -n will sort the folders by size. Helpful when looking to clear space.. This will be displayed in human readable format. The command you want is 'du -sk' du = "disk usage"
The -k flag gives you output in kilobytes, rather than the du default of disk sectors (512-byte blocks). 210M    drwxr-xr-x  21 kk  staff  714 Jun 15 09:32 . The paste utility creates columns from its input according to the specification that you give it. Given two input files, it puts them side by side, with a tab as separator. We give it the output of du -hs -- "$@" | cut -f1 as the first file (input stream really) and the output of ls -ld -- "$@" as the second file. In the function, "$@" will evaluate to the list of all command line arguments, each in double quotes. It will therefore understand globbing characters and path names with spaces etc. The double minuses (--) signals the end of command line options to du and ls. Without these, saying duls -l would confuse du and any option for du that ls doesn't have would confuse ls (and the options that exist in both utilities might not mean the same thing, and it would be a pretty mess). The cut after du simply cuts out the first column of the du -hs output (the sizes). I decided to put the du output on the left, otherwise I would have had to manage a wobbly right column (due to varying lengths of file names). The command will not accept command line flags. This has been tested in both bash and in ksh93. It will not work with /bin/sh. I always use du -sk (-k flag showing file size in kilobytes) instead. du -sch * in the same directory. update: I didnt like the previous one because it didn't show files in the current directory, it only listed directories. -ksh makes sure the files and folders are listed in a human-readable format and in megabytes, kilobytes, etc. Then you sort them numerically and reverse the sort so it puts the bigger ones first. Just be careful to look at the unit. This command also works on the Mac (whereas sort -h does not for example). du have another useful option: -S, --separate-dirs telling du not include size of subdirectories - handy on some occasions. just a warning, if you want to compare sizes of files. du produces different results depending on file system, block size, ... . It may happen that the size of the files is different, e.g. comparing the same directory on your local hard-disk and a USB mass storage device. I use the following script, including ls to sum up the directory size. The result in in bytes taking all sub directories into account. echo "[GetFileSize.sh] target directory: \"$1\""
echo "[GetFileSize.sh] invalid target directory: \"$1\" - exiting!" echo "[GetFileSize.sh] computing size of files..."
echo -e "[GetFileSize.sh] total target file size: \"$uiTotalSize\""
It took me a while to realise Nautilus sends the deleted files to its Trash folder, and that folder is not listed in du -sh * command. So, just wanted to share this, in case somebody faced the same problem. Then you will be able to get all sizes folders over all your server. Easy to help to you to find the biggest sizes. This awesome CLI utility allows you to easily find the large files and directories interactively. ncdu only calculates file sizes recursively once at startup for the entire tree, so it is efficient. I ran into an issue similar to what Martin Wilde described, in my case comparing the same directory on two different servers after mirroring with rsync. Instead of using a script I added the -b flag to the du which counts the size in bytes and as far as I can determine eliminated the differences on the two servers. You still can use -s -h to get a comprehensible output. -a, --all do not ignore entries starting with . place in init script like .bashrc ... adjust def as needed. Here, we want to list all directories which are greater than 1GB in size. KB, MB, GB, TB, PB, EB, ZB, YB (powers of 1000). Not the answer you're looking for? Browse other questions tagged linux unix or ask your own question. How can I list out the size of each file and directory (recursively) and sort by size decendingly in Bash? 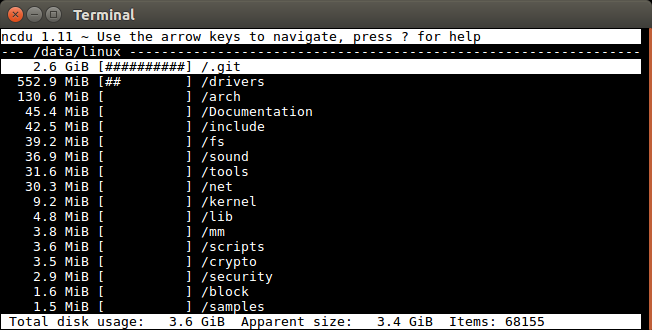 How to list the files and folders in a directory with its total size in Linux? How to list directory size of all child directories? How do I list all cron jobs for all users? Given two directory trees, how can I find out which files differ? How can I exclude directories from grep -R? Why does ENOENT mean “No such file or directory”?